12TH BIENNIAL CHAMBLEY AIR BASE REUNION NEWSLETTER - CLICK HERE! Click here to see the letter that was sent to Phillippe and Aline along with the five 1960's Chambley AB flying unit logo signs for the chambley Museum. A most generous benefactor makes this possible. Thank you! This page is dedicated to providing newspapers, articles and clippings from the archives of Chambley Air Base, France starting with the first newsletter from the General Leroy Eltinge, proceeding to the Plane less Air Base Article from the Stars and Stripes and hopefully as many copies of the good old Sabre newspaper that we all remember so well. So open up a file, sit back and enjoy your voyage down Memory Lane. 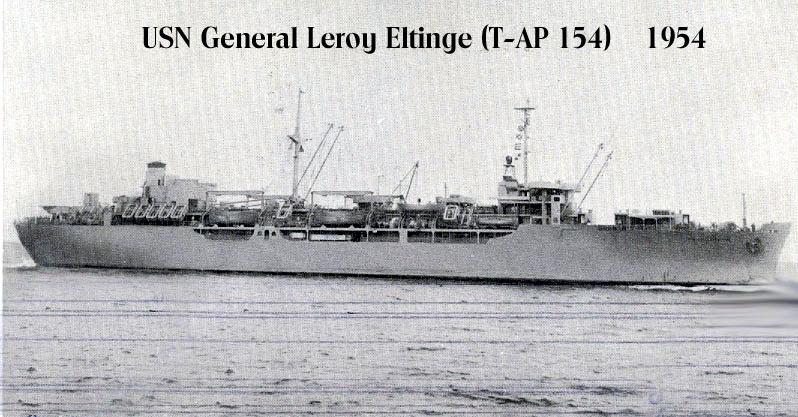 A special thanks to John P. Murtha from Richfield Springs, New York who provided us with an original copy of the Eltinge Crier dated 12 December 1954, the last day of our Atlantic Cruse. I remember - Do You! Also John provided us with the Starts and Stripes Article as well as the very first edition of The Sabre. Thank you John so much. One of a globe-circling fleet of Navy and commercial ships operated under the Military Sea Transportation Service. This Navy agency provides ocean shipping for the United States armed forces and other authorized agencies. Read below the last newsletter written on our cruise to France below.